Product prices and availability are accurate as of 2019-04-21 10:57:44 UTC and are subject to change. Any price and availability information displayed on http://www.amazon.com/ at the time of purchase will apply to the purchase of this product. How to get the blade off? set the collar setting to 2.0mm,then hold the blade,push it down. if your dogs or cats have long and thick hair,like German Shepherds,Havana,Himalayan,Yorkie,you need to use scissors (included) cut part of them at first,otherwise the clippers will jam up and don't work properly. Due to the shipping restrictions, your package does not include oil accessories,hope you can understand. 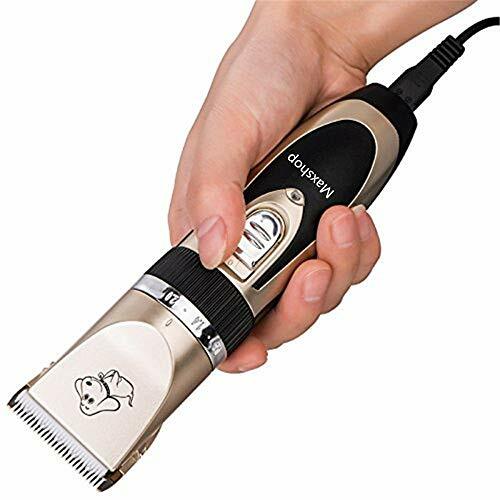 This pet clipper set keeps your pets always looking good, it's very useful both in home and profession salon use!Meanwhile, this clippers also suit to cutting human hair. 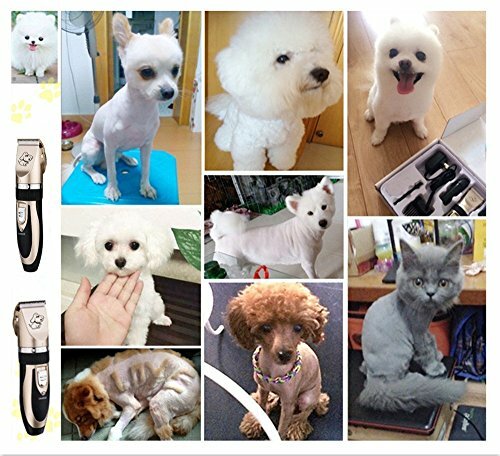 SUPER QUIET : Precision motor, low vibration and ultra quiet design, free it from work noise with only about 50 db, to help the pet feel at ease, not afraid haircut any more. Powerful motor (the spindle of which is made of fine copper), not to clamp and hurt pet hair. CORDLESS DESIGN : Light weight and cordless design for easy use. 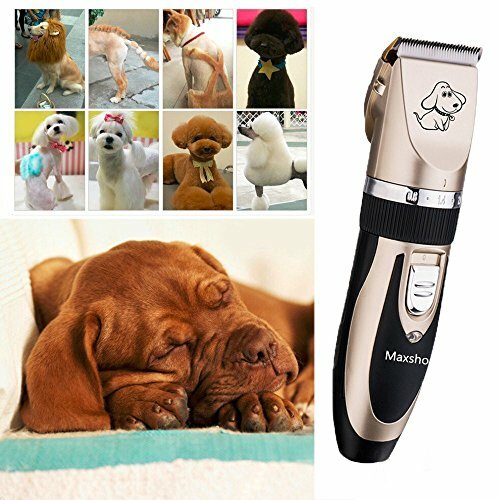 The pet grooming kit is equipped with a charger. Charging for five hours, it can sustain uses of 70 minutes. 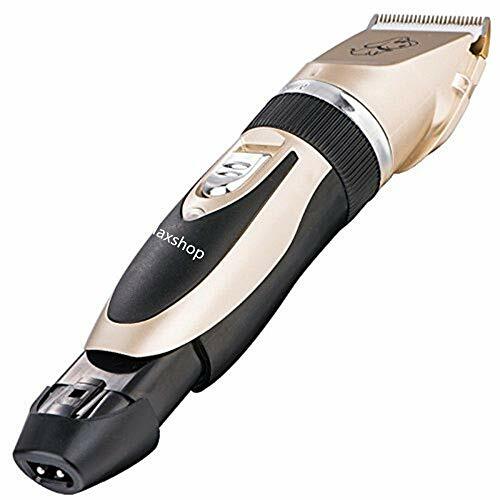 With the cordless clipper, you can no longer be bothered by the trouble of replacing batteries or boring wires. 4 GUIDE COMBS : The adjustable clipping comb is applicable for clipping hair of different lengths; and the detachable guide combs make for quick, easy comb changes and increased versatility. With 4 attachment guide combs: thinning-out, (3mm/6mm/9mm/12mm,) skin-friendly contour-following combs make it safe, easy, comfortable. SHARP BLADE : High quality stainless steel fixed blade and moving blade provide excellent cutting performance. The blade sharp enough eventhough it after a long time using and ensures high durability. Detachable blades for ease of changing and cleaning:set the collar setting to 2.0mm,then hold the blade,push it down. 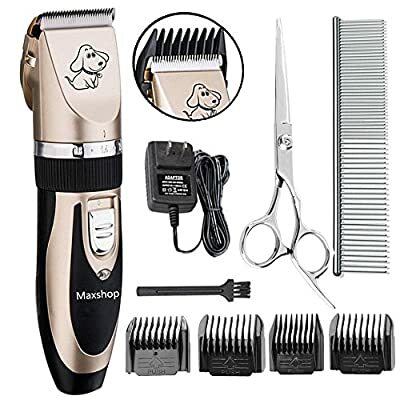 NOTIFICATION : If your pet have long and thick hair,like German shepherds,Havana,Himalayan,Yorkie,you need to use scissors (included) cut part of them at first,otherwise the clippers will jam up and don't work properly.Due to the shipping restrictions, your package does not include oil accessories,hope you can understand.